At this stage in his career, Francis Ford Coppola only pursues very personal projects. He likes making arty, almost ‘student’ films. 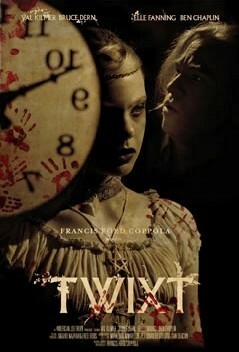 Twixt he made around his Napa Valley home in 2011 starring Val Kilmer, Elle Fanning (sister of Dakota who played Jane in Twilight) and Bruce Dern. Yes, it tells a tale of vampires. Or at least one. But more, it remains very much a dream, the kind of story told by poets feeling the effects of alcohol, not a horror movie but an eerie visit into mystery. The title was originally Twixt Now and Sunrise. Hall Baltimore (Kilmer), a third-rate Stephen King drowning his sorrows with wine, visits a small town where–he learns–Edgar Allan Poe once stayed. 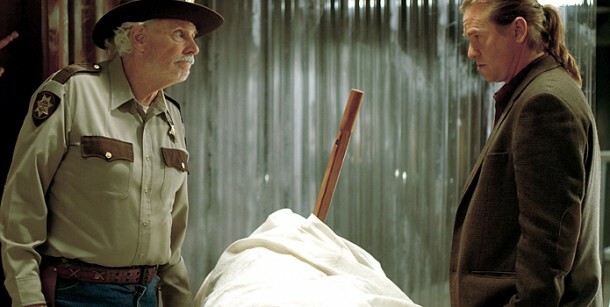 The local Sheriff (Dern) insists on telling him a story that should make a great novel. He takes the writer to see the morgue. A young girl’s corpse there reveals a wooden stake in her heart. Who would do such a thing? Why? She is not the only victim it turns out. Baltimore gets ready to leave, but only after an extremely tense Skype conversation with his wife. They need money. He himself seems unable to deal with what happened to his daughter, some kind of accident. And that night, he has a dream. Coppola in interviews notes that this film arose from a dream he had, about talking with a little girl while walking in the woods. Here we see that dream, complete with details of the various ghost children coming up from the floor of the hotel once visited by Poe. Events follow in which Baltimore seeks to learn more about the town. The 1955 murder of children in that now-abandoned hotel. How the town clock, with its seven faces, forever tells seven different times. His dreams now include conversations with Poe, who discusses what really happened–and how the townspeople distrust the people who live “across the lake,” a bunch of goth kids led by a young man named Flamingo. More than a few reviews of this film complain bitterly about lack of plot or an ambiguous ending-that-isn’t-an-ending. This review does not. Anyone looking for a thriller here mostly likely will leave disappointed. Rather, like Let Me In or Picnic at Hanging Rock, we become haunted by events and characters. In that way we become part of the film itself! We end up pondering what really happened. How much of what we see is supposed to have been real? How much of it dream? 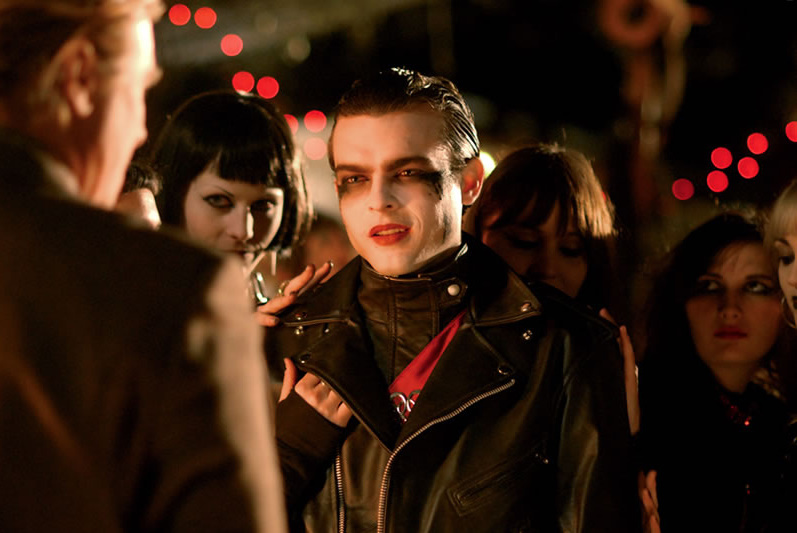 Baltimore intends to write a novel–how much of this film might be his version of events? That we do not know, that such choices remain our own rather than given us by Coppola, gives the film its power. But, not for everyone. For what it is worth, here is my own interpretation of events. By definition it contains spoilers, but not many. You might well view this as a tease, an invitation to see the film and make up your own mind. The mysterious girl V (Fanning) I believe to be Virginia, Edgar Allan Poe’s child bride. A vampire, but a decidedly mystical one as opposed to the relentlessly flesh-and-blood undead of such films as 30 Days of Night or the such t.v. series as True Blood. She remains a young girl, and the spirit of her husband lingers nearby. Hence for her, time seems more slippery than to us, and anyplace wherein she dwells becomes…strange. Like this town. Does she do harm? Some. Perhaps. But mostly she remains sinned against than sinning, and despite the fear she engenders the truth seems to be that her Kiss is something of a blessing. True monsters in this story remain human, mostly bigots, especially violent ones. She reaches out via dreams to Hall Baltimore for her purposes. His experiences as a result may frighten, but they also illuminate. So I see it anyway. DC Cancels I, Vampire – NoOoooO!